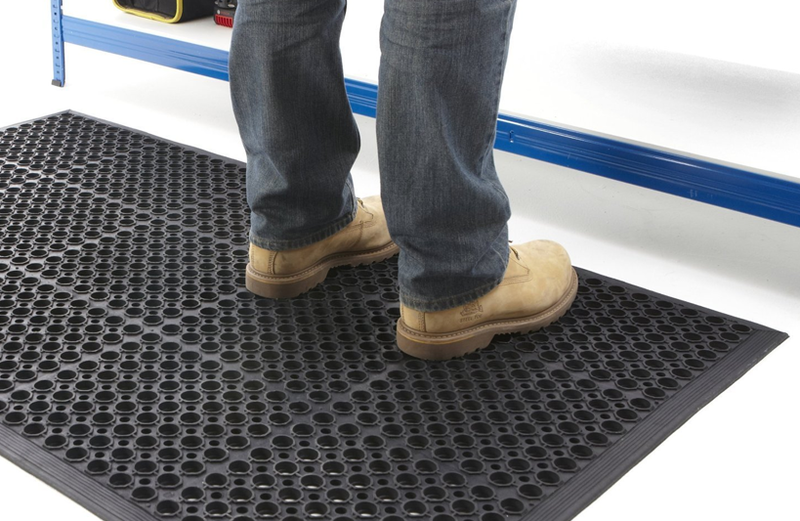 Anti fatigue matting is a growing necessity in the modern workplace, standing for long periods of time on hard floors can cause fatigue and a host of other complaints, this can lead to decreased productivity. Our wide range in hard wearing PVC and rubber is easy to clean and hygienic and available in solid, open grid and cushioned grades. We are distributors for one of the largest manufacturers of anti fatigue matting , Wearwell are industry leaders in this sector, a high quality, highly durable and affordable matting solution, our partnership with them has allowed us to offer the best product at competitive prices. We also stock a full range of fluted, broad ribbed, circular stud and hollow ring rubber matting, and our electrical insulation matting ( 11kv/15kv ) meets all industry standards.